Three Egyptian judges and their driver were killed on Saturday when gunmen opened fire on their vehicle in the North Sinai city of Arish, sources told Al-Ahram Arabic news website. A fourth judge in the microbus was severely wounded. The judges were on their way from the city of Ismailia on the Suez Canal to attend court sessions in Arish when gunmen in three cars attacked the judges' microbus. The attack comes hours after a Cairo court issued a preliminary death sentence against former president Mohamed Morsi and 105 other defendants on a range of charges, including murder. In a separate case also on Saturday, the court issued a preliminary death sentence against leading Muslim Brotherhood figures Mohamed El-Beltagy and Khairat El-Shater, as well as 14 others, on charges of conspiring with foreign groups to destabilise Egypt. 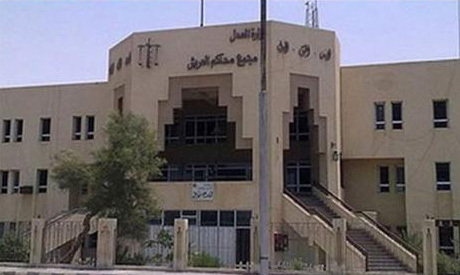 Islamist militants, who have primarily targeted security forces since the Islamist's removal, have also attacked several judges in the past two years. On Sunday, three improvised bombs exploded near the home of judge Moataz Khafagi who had given out death sentences and lengthy jail terms to Islamist defendants. The blast damaged the building's facade and broke the windows of three cars. The judge escaped the explosion unharmed but four other people were wounded. In March, a small bomb was left in front of the house of judge Fathi Bayoumi, who investigated the corruption charges against Mubarak-era interior minister Habib El-Adly. The words "a gift for El-Adly’s acquittal" were ascribed on a wall near the device. In January, a bomb attack targeting judge Khaled Mahgoub, who is acting for the general prosecution in one of the trials brought against Morsi over the jailbreak charges, caused damage to the windows and walls of his house. In a statement, Egypt's presidency offered condolences to the families of the victims, expressing faith that such incidents "will not deter Egypt's honourable judges from their noble mission." Egypt is going in right direction.